How complex is Fate Core character generation? Following the recent running of my skytrain scenario (details here) for my face-to-face group, one of the members of the group expressed their dissatisfaction with the 3 stages character generation system for determining character Aspects. What is the 3 stage character generation? If you accept the complication then you receive a fate point and the scene plays out as any other scene in the game, if you don’t except it then not only do you not get a fate point but you actually have to pay one to avoid it. Aspects are a great way of building a narrative around a character and of steering plot towards what you (as a player) find interesting, since, as a storyteller if one of my players has “best gunslinger in the west” then I know they’re interested in high-action gunfights and it’s in my best interest to include some in the game. Okay, but what about the 3 stage creation? Well in the game one of your Aspects is called your high concept and in a summarisation of your core concept whilst the second is your Trouble, the main source of complication in your live; in Fate Core it suggests that you determine the other three using this 3 stage creation. Essentially, in stage one you come up with a first adventure or scenario involving your character and jot down what occurred in that adventure and then pick an Aspect related to it; in the next stage you pass the notes on your adventure to the player sitting on your left (and in return receive the adventure notes from the person sitting on your right) and come up with an idea of how you had a guest spot in their adventure and pick an Aspect based on that. This repeats for stage three, the idea being to build up a web of connections between player characters before the game even starts. I like to liken this process to superhero films, with the actual session being the Avengers film, where all the heroes come together and the three stages being the solo-hero films (with odd guest spots from other heroes) that came before. So what does this have to do with an 11 year old generating a character? I have to admit to being taken by surprise when one of my players expressed dissatisfaction with the 3 stage process (a part of the character generation that I had always thought to be fairly straight-forward and useful to avoid that often stilted ‘meeting up’ scene in RPGs), since i’ve used it in a number of Fate Core games and it’s never been a problem. Of course, this part of character generation, is easily jettisoned, characters can simply invent their Aspects with no real harm to the game; however, my more pro-active player also seemed a little taken aback by the idea that the character generation was in any way difficult (having being unable to make the character generation session, but still managing to create his character in about fifteen minutes at the start of the session). He proposed an experiment, his 11 year old son had recently expressed an interest in roleplaying, so he bought the lad over and both him and myself went through creating a couple of characters using the Fate Core system. Wanting to stick to something that the boy was familiar with (since he’s never really done any RP before), we created military characters in a Call of Duty style. Timing the character generation we took half an hour to create the two characters using the 3 stage method, and this included time to explain a few things about Aspects, Stunts and Skill. Granted the characters we ended up with (a ghost-like stealth operative who had been sequestered for this mission after successfully blowing up an enemy submarine and a mercenary pilot who had been bounced from the regular army following an incident with collateral damage) weren’t the most nuanced characters, nor were they the most detailed, however they were both perfectly playable and already had links and a reason for working together. Think about it, I believe that the Fate system in general seems to work better for people who think more about the story/narrative of a game (although granted it isn’t a great fit for every type of setting, since no game can do everything perfectly) whereas those who prefer to jump into the stats of a character and then fit a background of this seem to not enjoy it so much. That is just my own experience though; when I next run Fate Core, if it’s a one-off then i’m going to have pre-generated characters created (with some limited customisation options) and if it’s a campaign I may adopt something similar to how background and character connections work in Dungeon World to help determine Aspects. It occurred to me recently, following a character genning session that took an awful lot longer than I expected for a Fate Core game (so long in-fact that we had to reschedule the game for another evening), that a character creation system that seemed so streamlined and simple for myself may not be so for other; as a die-hard Fate fan I personally find the creation of Aspects and generating a character very simple and easy to do, because i’ve always got a fair few ideas for characters and the system allows me to create something that matches these ideas. But what about people who perhaps don’t have such a lot of character ideas buzzing around in their head? This doesn’t make them any worse roleplayers by any means, however, whilst there has been some discussion about the fact that Fate adopts a certain approach towards a game and that it doesn’t suit all games equally (after all no one system is going to be perfect for all styles of game “out of the box” as it were), perhaps the default method of character generation isn’t necessarily suitable for all people. Some players had difficult thinking up suitable powers or working out how to frame them within the rules system. Greater familiarity with the rules would help here and perhaps creating a list of example powers would have given them a good starting point. There was some trouble with thinking of reasonable ways to link the different characters together using the ‘three phase method’ listed in the Fate Core rulebook. Perhaps toning down the number of phases to just having a starting story/phase for each character and then allowing them to come up with their Aspects in a more freestyle manner; although doing this would then require a different method of linking the characters together. Stunt creation caused some notable pauses as the players struggled slightly with deciding on what they wanted their stunts to do. The example stunts listed in the Fate Core book helped in this regard as did referring back to the characters core concept. I think that in retrospect I would probably have been better to create some (either fully or partially complete) pre-gen characters that the players could choose from and perhaps tweak to make more to their liking since, whilst I think having a full session for character generation is all well and good for a longer running campaign, it seems a little OTT for a one-off. Hopefully coming up with some pre-gens in future would also make it a little easier on those people who struggle with getting over that initial imagination ‘hurdle’ when it comes to creating a character idea. I’ve been toying around with the idea of a Fate Accelerated game involving vampires for a few days; thought i’d post up what i’ve jotted down so far. Please note: The notes below are in no way complete and will probably change considerably before I consider them finished. 1) High concept – May be whatever the player wishes. 2) Trouble – Is determined by the player. 3) Vampire – character must have a vampire aspect to be considered a kindred. 4) Clan – Pick one Aspect which determines a vampires clan. 5) May be whatever the player wishes. Vampire characters have the normal approaches (with the standard levels). Disciplines are special type of Stunt purchasable only by vampire characters; a vampire may have a maximum number of discipline Stunts equal to 2 + their vampire Approach (3 at character gen). I have not detailed vampire powers yet, however my current thoughts are that by spending blood points a vampire will be able to either add their Vampire Aspect to a roll or activate some other sort of Stunt-like effect. In addition to Fate Points (which are used as normal), vampires also have a pool of Blood Points (recommend using red tokens to differentiate these); this blood tokens are used to power disciplines. A character begins play each session with a number of blood points equal to their Vampire Approach +2 (three for starting vampires), the number can be raised above this level by feeding. Blood tokens can also be used with the characters Vampire Aspect on almost any roll to gain a +2 or a re-roll (as with a fate point), however, when a player character does this they are calling on the innate power of their blood and exposing their vampiric nature; they gain the Aspect “Inhuman Creature of the Night” for the rest of the scene and the one following (this can be compelled as normal). PLEASE NOTE: Using a blood point to power a Discipline Stunt does not cause this effect, although using a discipline infront of mortals may cause its own problems. When a vampire feeds on an individual during a scene they gain 1 Blood Point. If a vampire is ever reduced to 0 blood points then he automatically gains the Aspects “Inhuman Creature of the Night” and “Frenzied Bloodlust” and is reduced to the level of an animal that just seeks to sate its bloodlust, these Aspects are lost only once the vampires BPs are raised through feeding. All vampires begin with the Aspect “Vulnerable to Sunlight” and they are actually attacked by Sunlight (using the normal attack roll method) whenever exposed; the modifier to the Sunlight’s attack roll is the defending vampires Vampire Approach (representing that as vampires become more divorced from their humanity their curse affects them to a greater extent. Some lively discussion was generated by my recent blog post about how one of my NPCs was statted for my last Rogue Trader FATE game, there was some great advice given on G+ and Blogger by (amongst others) Julius Müller, Tim Noyce, Robert Hanz and John Miles; looking back over the character cards that i’d prepared, in light of this information one of the NPCs that I had tagged as a main NPC didn’t really seem to have the stats to back that up so i’ve made a few tweaks and amendments. Thought i’d post a copy of the card, as currently stands, he to see what people think; any constructive comments welcome. Following on from my last blog post about a D&D style hack for the FAE system (http://wh40krpg.blogspot.co.uk/2013/07/d-style-fate-hack-could-classes-be-used.html) where I pondered the idea of using class style descriptors as Approaches for a D&D-esque FAE game this post addresses my thoughts on character races (although species would be a more accurate term) and skills in the game. Rogue – sleight of hand, stealing things, breaking and entering, deception and also shmoozing and general social actions. Spellcaster – casting spells (obviously), working out what spells other people were casting, crafting magic items, examining magic items, feats of prestigitation, etc. Priest – interacting with church/holy order members, researching/recalling information about gods and their followers, making blessings, etc. Ranger – covers wilderness survival and skills. The term ‘race’ in D&D tends to actually refer to a different species (ie. orcs, dwarves, elves) all that generally seem not to share a common ancestry, but never-the-less the term race has been widely used in RPGs since the early days. In this hack I would make the characters race a specific Aspect that can be invoked or compelled under specific circumstances. Dwarves – hardy and skill craftsmen with a very traditional outlook. May be invoked when: Calling upon the wisdom of ancient traditions, craft rolls related to stone or metal work, fighting with a hammer, finding your way underground, perception rolls in darkness, appraising gems, stone or metal work. May be compelled when: New innovations or technology are at odds with traditions, faced by their ancient greenskin enemies, when the distrust between dwarves and elves bubbles to the surface, when a dwarves appreciation for precious stones may turn into greed. Elves – graceful and beautiful creatures at peace with the natural world and with magic singing in their blood. May be invoked when: Using magic, moving unseen or finding sustenance/tracking in the wilderness, social interactions with people awed by the elves beauty, using a bow, perception rolls in dimly lit conditions. May be compelled when: Vanity causes them to dismiss the opinions and thoughts of ‘lesser’ races, when the distrust between elves and dwarves threatens to bubble to the surface. Orcs – strong and stubborn creatures raised in a brutal martial tradition. May be invoked when: Assessing the strength/value of armour and weapons, facing down another in a one-on-one combat, perception tests in the dark, tests of raw strength. May be compelled when: An orcs bloodlust overcomes their reason, they are shunned by ‘civilised’ races. Halflings – Clever and capable opportunists with a mischievous streak. May be invoked when: Small size allows them to slip from an opponents grasps, looking harmless allows them to evade notice, tests of manual dexterity. May be compelled when: A halfling cannot resist the urge to cause mischief, a halflings small stature and lower strength causes them problems. At the moment I would having the following Aspects on the D&D-style hack character sheet. I think the beauty of having the race as an Aspect (and one of my favourite parts of the FAE/FATE system) is that it is tremendously simple (requiring no real modification of stats), uses the existing mechanics of the game and all the players and GM have to remember is what compels and invokes can be used against racial Aspects; the Aspect Race also encourages the constant using and flowing of FATE points that is at the heart of the system. This is something I hashed out in my Cthulhu-FAE hack, instead of bringing in a big list of appropriate skills (which is essentially trying to turn FAE into FATE core, something i’m keen to avoid since I love FAE’s simplicity) skill groups can be represented by suggesting Stunts that provide bonuses in applicable situations. Master of the [insert name of weapon]: The player receives a +2 bonus to rolls made using the [weapon] (for example: A ‘Master of the Sword’ attacking with a short sword would gain the +2). Shield Mastery: The player receives a +2 to their defence rolls when using a shield. Escape Artist: +2 when escaping bonds. Herbalist: +2 to rolls to analyse/use herbs. Professional Lock-pick: +2 to pick locks. As you can see i’ve not yet put up any rules concerning weapons or armour, my current thought is to leave them nebulous so that they don’t needlessly complicate the system; anyone may have appropriate equipment but only gain a benefit if they have an appropriate Stunt or Aspect. Likewise with Non-weapon Proficiency Stunts, pretty much any skill from D&D3.5 could be turned into a Stunt just by it granting a +2 in the appropriate field of study or endeavour. Those of you who have read more of this blog may have seen the IC write-ups of a Hunter: the Vigil game that I have been playing in recently (the write-ups of the two previous sessions are posted here and here); this game is being run by a friend of mine using the nWoD Hunter: the Vigil rules. In the game we are playing members of a supernatural serial-killer investigation unit composed of psychics known as VASCU; our party consists of a grizzled ex-cop whose party disappeared in a strange case that was swept under the carpet (this is my character), a bureau agent who squandered his family fortune seeking to find his father whom he believes kidnapped by cultists, a technical whizzkid and a wheelchair bound agent who was seriously injured pursuing a case. The game was originally part of a proposed ‘one-off wednesday’ idea where, every other wednesday, a group of us would get together in the evening and run a one-off game (my thoughts on one-off games can be viewed in this blog post); so far we’ve had Judge Dredd (by Mongoose Publishing), a homebrew tron-esque game where we played ourselves in a strange future where a fantasy realm had intruded on our reality, a Star Trek based game and the Hunter game. The Hunter game is the first of our ‘one-offs’ that has been heavily investigation based (my Judge Dredd game touched on these themes but the investigating part of the game was fairly simple and fast paced); as a result, although it has been very entertaining to play, the game has already run into a second session and we are scheduled to play a third. Although the GM freely admits that he is more used to running campaigns that one-shot sessions and that this may have contributed to the length of the game, I started to wonder whether this was the only factor or whether there was something in the nature of investigative games that lead to them taking a great deal more time? 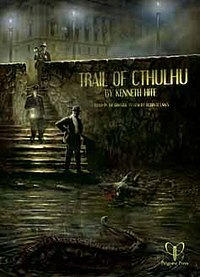 One of the more interesting investigation based games that I have read recently is Trail of Cthulhu by Kenneth Hite (a game I intend to review on my blog in the near future) and based on the GUMSHOE system by Robin D Laws (who also wrote the fast-paced and bizarrely wide-ranging hong-kong action movie game Feng-Shui, another of my favourites). One of the things I love about ToC is that it makes no qualms about it’s adaption of the popular Call of Cthulhu game to a different rules system and the designers obviously have a great deal of respect for the source material (both mythos fiction and previous RP materials). The introduction to ToC discusses what I consider to be one of the perennial problems with the investigative game; what might seem an obvious solution to the GM may seem baroque and incomprehensible to the players since they lack the GMs privileged knowledge about the backstory and have to find everything out the hard way, not only that, but in some systems a failed search or investigation roll on the dice can lead to you missing a vital clue and thus taking a lot longer to solve a mystery (assuming that you can solve it at all). Now you might say that a good GM can always fudge things so that the players come across a clue or that something happens to advance the plot; however if this is not done subtly and with finesse then it can lead to the players feeling railroaded as though, no matter what they do, the mystery solution will reveal itself, IMO once the perception of risk or failure has disappeared completely from a game then a lot of players lose their impetus and drive. So how does FATE fit into all this? A valid question that you might be asking yourself by now; I feel that there are a number of mechanics and ideas that could be ported from Trail of Cthulhu across to either FATE core or Fate Accelerate Edition (FAE), some of these and my own ideas are listed below. In ToC the character all have occupations that help determine their skills and equipment; these could be ported across to FATE as either Aspects/High Concepts or (if a more complete overhaul including skills was desired) they could be used as templates to determine what sort of skills and stunts a starting character has. For example: The Antiquarian occupation in ToC has the following skills – Architecture, Art History, Bargain, History, Languages, Law, Library Use, and any one Investigative ability. They also have a special ability where once per session they can discover a book that contains a clue to the current investigation or some relevant investigation. This skill list could easily by imported, the Antiquarian label taken as a High Concept and the special ability changed into a Stunt. Drives are a character’s main motivation in Trail of Cthulhu and include concepts such as Adventure, Antiquarianism, Arrogance, Artistic Sensitivity, Bad Luck and Curiosity (amongst others); these could also be ported across as Aspects into a FATE based game. Skills (or Abilities as they are known in ToC) are a lot more specific that they are in FATE, and are split into Investigative and General abilities; Investigative abilities are those that allow you to find information and clues, progressing towards solving the mystery and include such skills as Archaeology, Library Use and Occult, whereas General Abilities are your more generic RPG skills such as Athletics, Firearms and First Aid. Tell how long something has been buried and date of its construction. Identify artifacts by culture and usage. Distinguish real artifacts from fakes. Navigate inside ruins and catacombs, including finding secret doors and hidden construction. Describe the customs of ancient or historical cultures. Spot well-disguised graves and underground hiding places. The game posits a simple and yet refreshing method of locating clues and progressing through a mystery/investigation plotline. Get your Investigator into a scene where relevant information can be gathered. Have the right ability to discover the clue. Tell the Keeper that you’re using it. Assuming that this occurs then the GM will provide you with any clue that corresponds to your query. In each scene the GM designates a core clue that is required before the players can move on to the next scene (although their may be additional supplementary clues for the players to discover). One of the most interesting ideas about the game in my mind is that players can ‘spend’ points based on their Investigative Abilities to gain additional information about the clues; this information is never required to progress in the game but provides extra flavour to the game. Both the use of Investigative Abilities to automatically locate clues and the spending of ‘points’ to gain additional information regarding the clues are both concepts that I think would be easily convertable to the FATE system; clues can easily be given out related to the skills possessed by players (possibly excpanding the list to include more detailed investigative abilities as per To) and either an additional pool of investigation point can be added or the existing fate points can be used to gain additional info in a FATE based ToC-style game. I’m planning to try a ToC style FATE game once it rolls round to my turn to GM in our ‘one-off Wednesdays’ again, i’ll post how it goes.